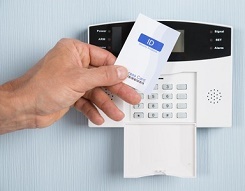 That’s a good question as many believe that the main benefit of an alarm is the visible deterrent and it doesn’t necessarily matter whether it even works. This is certainly very relevant to our #AlarmSetGo campaign that aims to encourage those who have an alarm fitted to use it. We would obviously make the case for a fully working alarm, regularly set when away from the house or overnight. In previous posts we’ve explained why it’s important to set your alarm and provided some solutions for the common issues that prevent people from setting it but we also thought it would be interesting to look at what other people say on the issue. This highlights the potential risk of an insurance claim being rejected if they believe you didn’t act in accordance with the terms of your policy. This stresses the importance of setting an alarm and not relying on a dummy alarm to act as a deterrent. These victims discovered that just having an alarm was not a sufficient deterrent, with the burglar no doubt taking the risk that the alarm would not be working or not set. On triggering it, they soon thought better of it and left the scene – just showing that the alarm was very effective in this case. These comments show that burglars really do know what they’re doing and while the average member of the public would not be able to spot a dummy alarm or recognise one that isn’t set, that doesn’t mean that a professional burglar won’t. These comments, taken from various sources, really do demonstrate why it’s so important to make full use of your burglar alarm – an action that is often more about modifying behaviour than spending money. So, if you do have a home burglar alarm then please make the effort to use it consistently. It might make all the difference. next Neighbour’s Alarm Driving You Crazy?